US oil company Chevron on Wednesday confirmed a fire at its Utonana production facility in southern Nigeria, hours after the region's most active armed group MEND said it caused the incident. 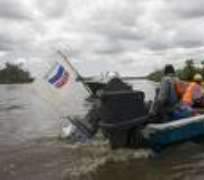 Chevron Nigeria Limited "confirms that there was a fire at the Utonana production facility in Delta State on Tuesday June 09," the company said in a statement to AFP. "Our workforce is safe, relevant stakeholders have been informed and we are continuing to assess the situation and work to restore the integrity of the facility which had been shut down before the incident," it added. Chevron did not disclose the cause of the fire but the Movement for the Emancipation of the Niger Delta (MEND) had claimed in a statement that it set the pumping station on fire. Chevron's Otunana station in Niger Delta "is currently engulfed in fire after being overwhelmed by our fighters," MEND said. MEND, which warned of new attacks last weekend, has staged several attacks on foreign oil facilities in Nigeria as part of its campaign to get what it calls a fairer distribution of the region's oil wealth to local people. But the military Joint Task Force (JTF) protecting oil installations and personnel in the restive Niger Delta said Wednesday the Chevron fire was not an act of sabotage by militants. "The fire resulted from a system failure from one of the platforms," JTF spokesman Colonel Rabe Abubakar said in a statement, refuting the claim by MEND. The JTF also assured "the general public and oil companies operating in this region that the JTF is equal to the task of protecting them, no matter where the distractions and intimidations are coming from." The past three years have seen an upsurge in violence in the restive oil region, reducing Nigeria's daily output to 1.76 million barrels compared with 2.6 million barrels in January 2006.